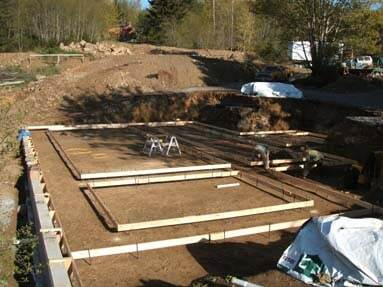 Batter boards are being leveled and placed for the footings. 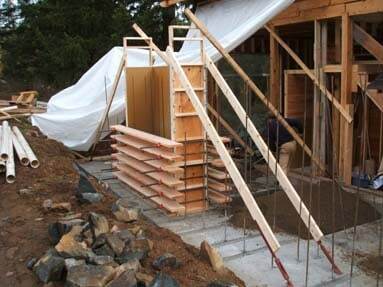 Wide footings can support the heavy walls but also act to give seismic stability and make a bond beam unnecessary. 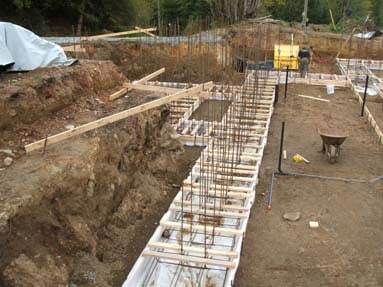 Steel is in place and the footings are ready for concrete. Fidel admires the first column on the house, it is one of two at the entrance that are 12′ tall. 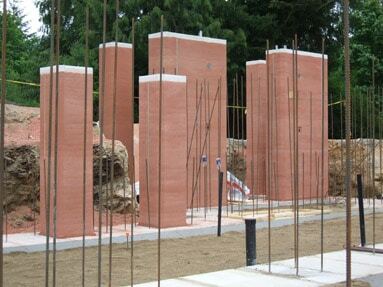 It is wet as the forms have just been removed and will turn pink as the column dries. 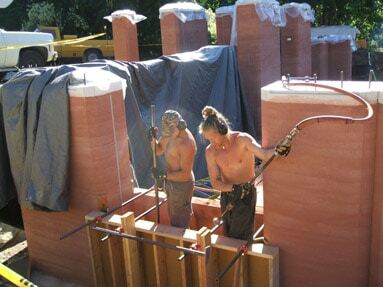 Ramming one of the 12′ entrance walls on a beautiful sunny day. 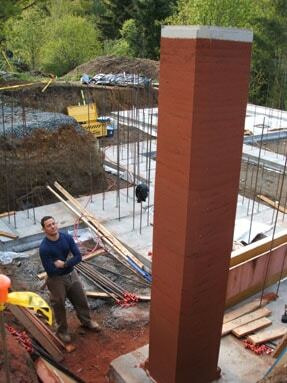 A couple of 8′ rammed earth pillars with the 12′ entry walls in the background. 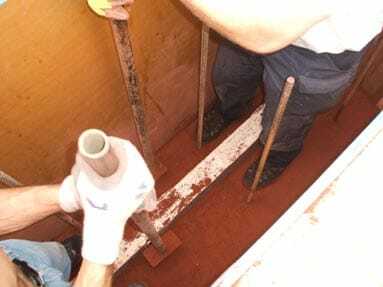 Making a corner wall section. 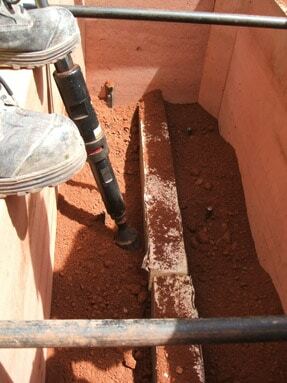 A mechanical rammed earth tamper on loose material with the isulation showing. Ramming an infill, a window will go above this section. 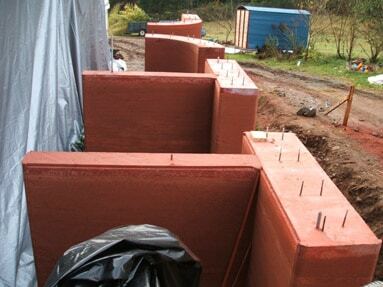 Green rammed earth for the kitchen wall. 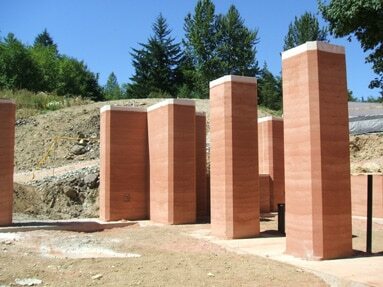 These are some of the nicest rammed earth pillars ever! A big statement yes, but true. The layering and texture of these pillars is fabulous, the picture doesn’t fully capture the feeling in real life. 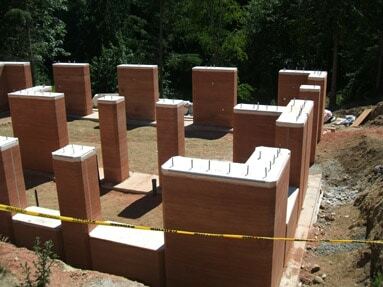 After the last corner wall is completed. 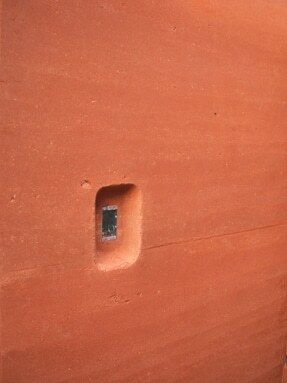 The rammed earth is complete! It was an epic journey and very rewarding. 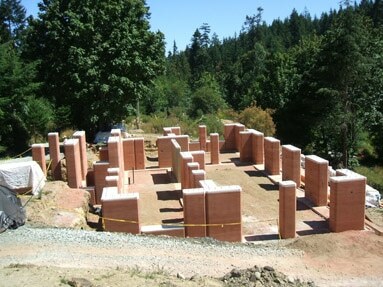 Building the Hart House walls was a challenging build. That November was the rainiest and windiest in 50 years and it rained almost every day but we persevered and are very proud of the results. Josh and Heidi went bold with red walls and it was a fabulous result. 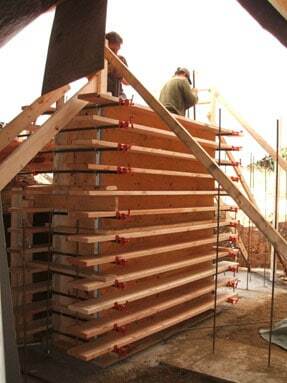 The exterior walls of this house are 2′ thick which is a standard width for exterior walls. The first form is ready to go. 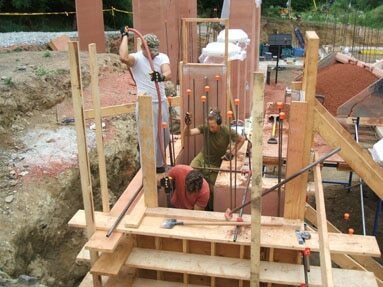 Clifton and Lowe inside the forms hand tamping. 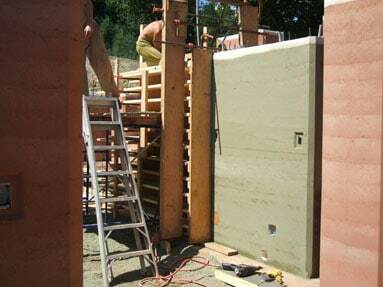 A good view of an insulated rammed earth wall in the making. 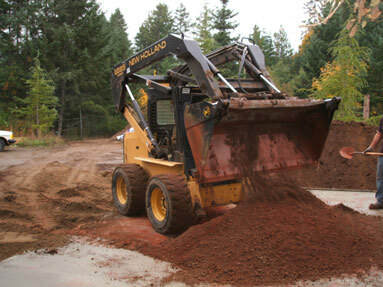 We use a rigid insulation that can withstand the forces of compaction. 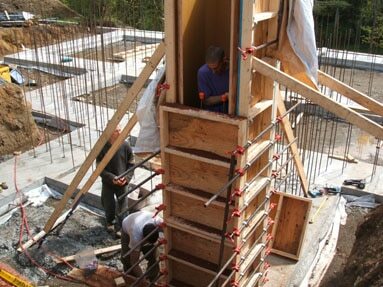 The rammed earth forms we use are an efficient and flexible system of forming plywood, pipe clamps, form aligners and dimensional lumber. 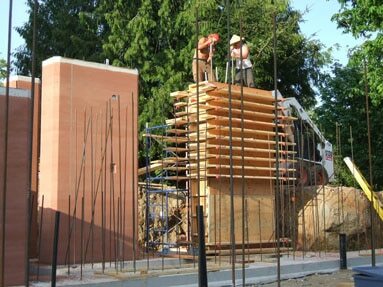 The wood can be used on other parts of the building after the walls are done. 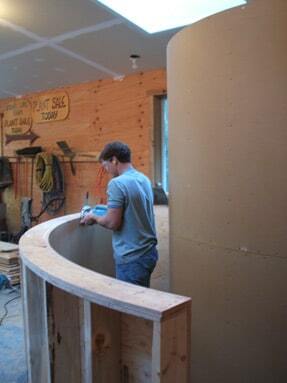 Making the forms for the curved rammed earth walls. The forms are made in 4 pieces, 2 of which are very heavy, they are made with 3 laminated sheets of plywood that have been glued and screwed extensively with vertical 2×6’s. 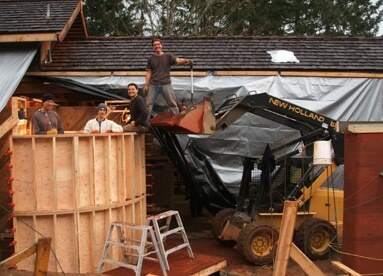 Ramming the first curved wall on a cool November day. View of the top of the walls on a rare day we had the tarps off. Recess detail of an electrical box. 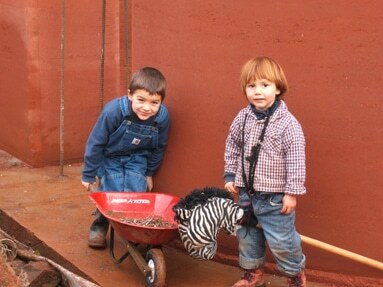 Our little helpers, purely voluntary..no child labour here! 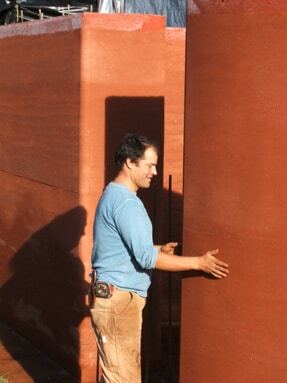 Josh feeling the good vibes of his new rammed earth walls.